Get your Free 8x10 Farmhouse Printable sent to your email now! If you have been following me for a while, you know that I love to post recipes with step by step photos. But you can scroll down to the end of this post if you want to get the steak recipe! 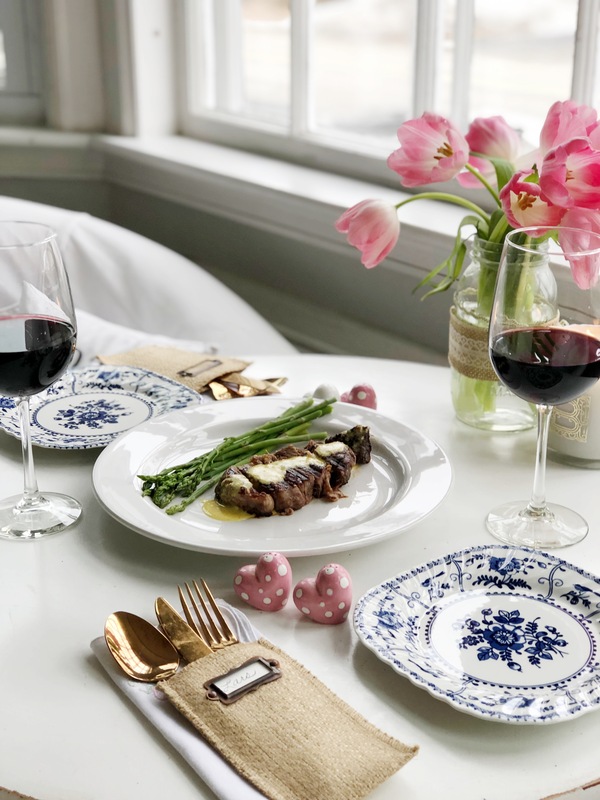 This delicious KETO recipe is the perfect romantic recipe for two! So, I am starting to collect recipes that are easy for just me and my man. And since I’m pretty sure I will be doing KETO for the rest of my life, I just had to try this one. And it is perfect for Valentine’s Day! I don’t have a double boiler if you don’t either all you have to do is fill a larger pan halfway with water and place the ingredients in the top pan! 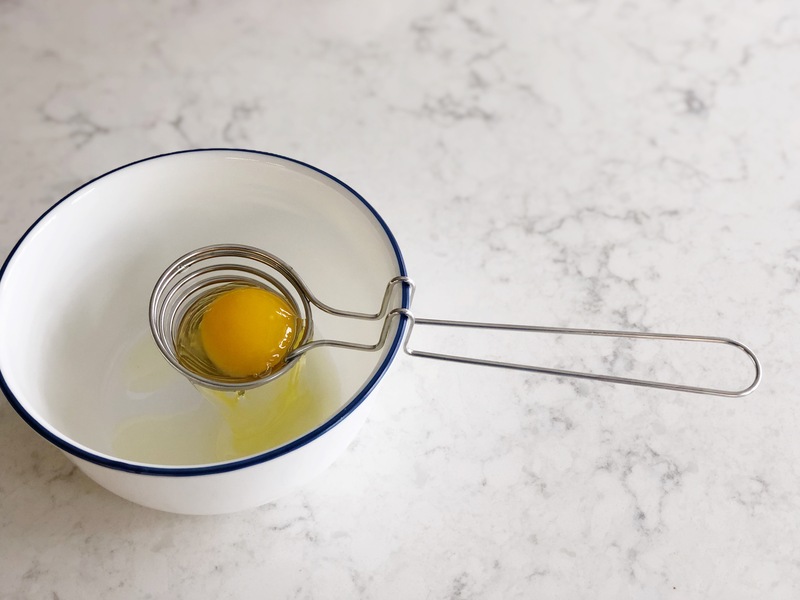 I love kitchen gadgets that make cooking easier, and this tool for separating egg yolks is terrific! I got this one at a Pampered Chef party. If it starts to curdle as it did for me, add an ice-cube and it will smooth! 3. Remove top pan from bottom pan. 4. 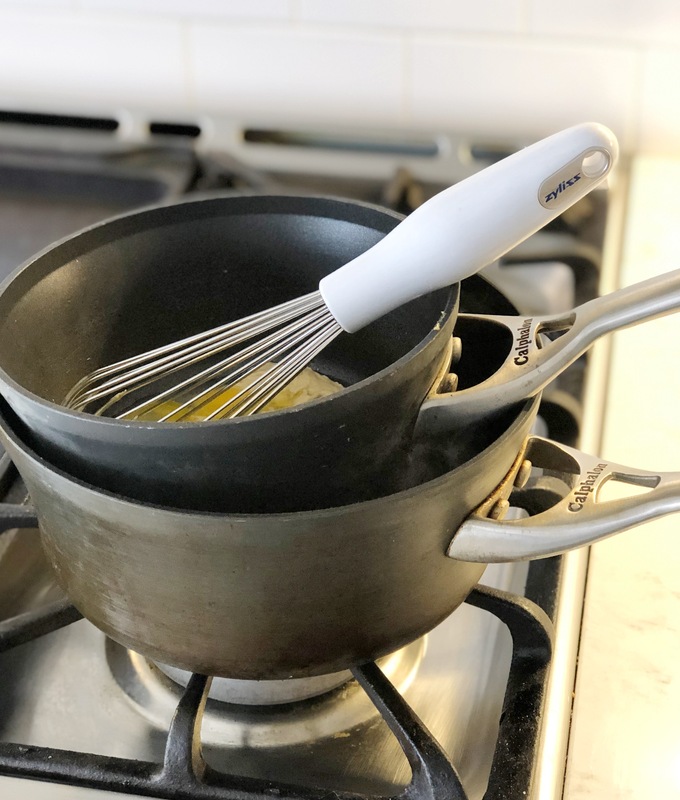 In a separate saucepan on low heat whisk together apple cider vinegar, white wine vinegar, minced shallots, pepper, and tarragon until the liquid is reduced by half. 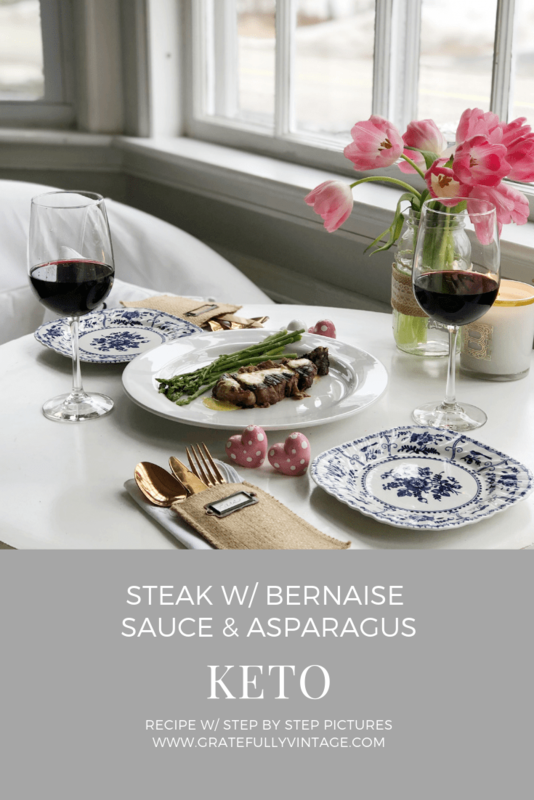 Viola, you have Bernaise Sauce! 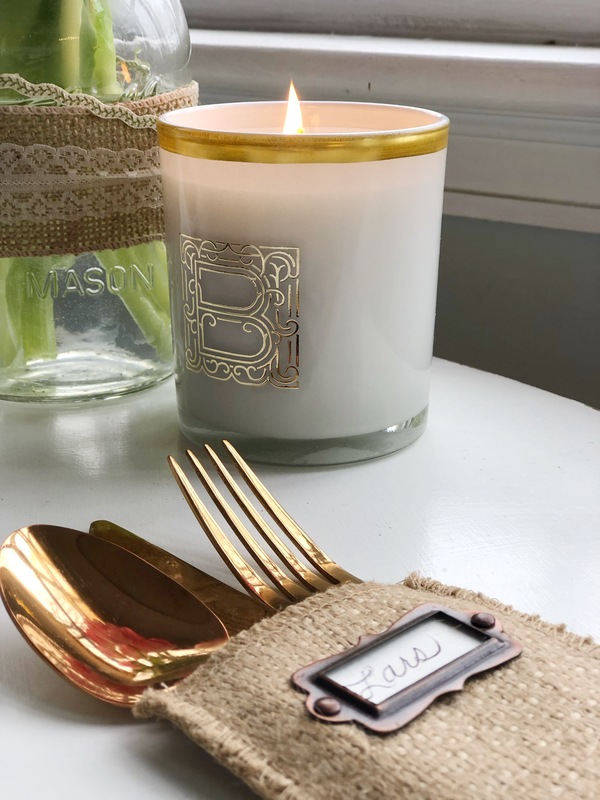 You can find the above Bourdeau Home Candle, here. It is a hand-poured soy wax candle and it burns for hours! 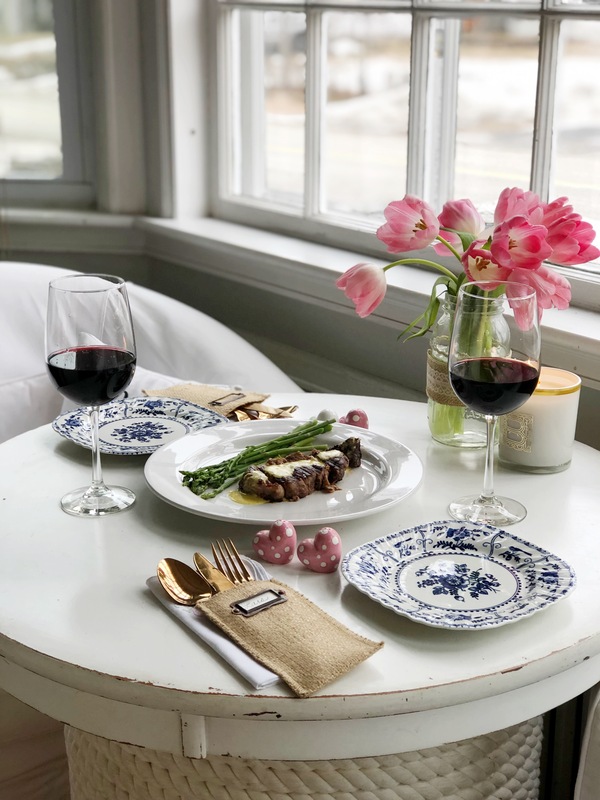 Candles must be added to a romantic dinner! 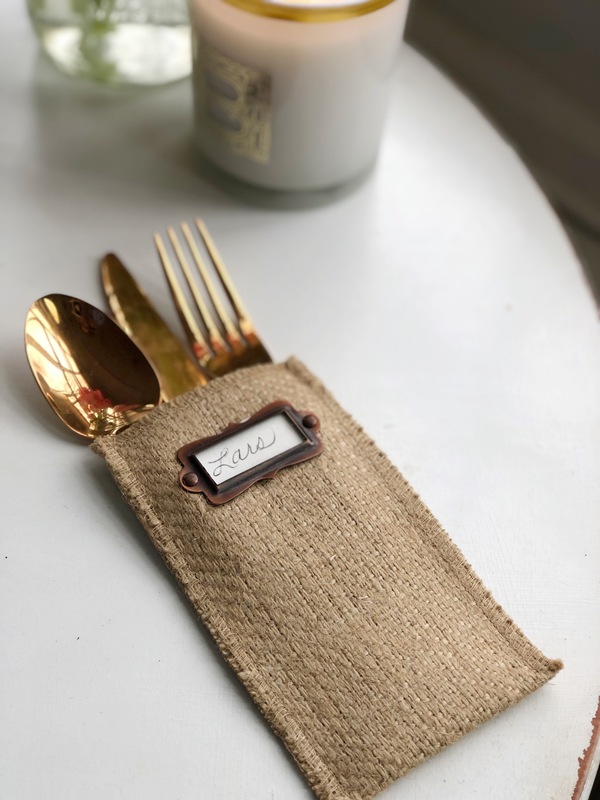 Aren’t these silverware pouches adorable? My BFF brought them back for me from her trip to Magnolia. I paired the steak with Merlot & Asparagus. For the Asparagus I blanched the spears in boiling water with salt added for 7 minutes. Boil the water, add the asparagus, return to a boil and then remove from the heat for 7 minutes. Add some seasonings if you want too. My husband does not eat Keto strictly, so I added a baked potato and bread to his plate! Delicious Steak with Keto Bearnaise Sauce! 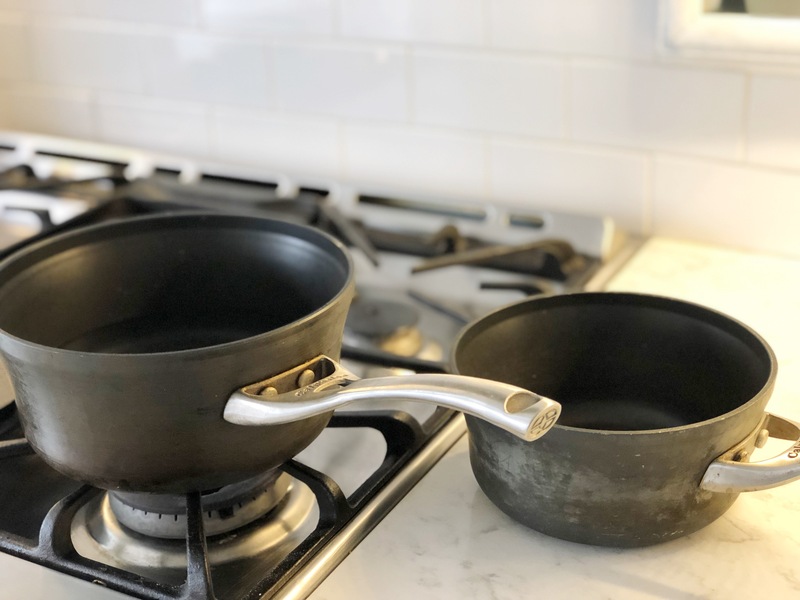 Using a double boiler, or two saucepans stacked together (pics above) gently boil water on the bottom pan. 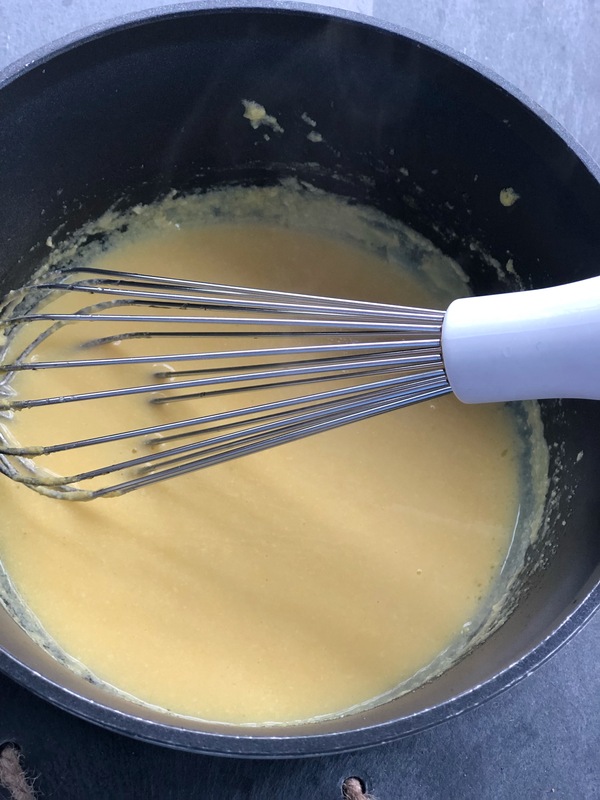 To the top pan add the egg yolks, Dijon, & lemon juice & whisk together. 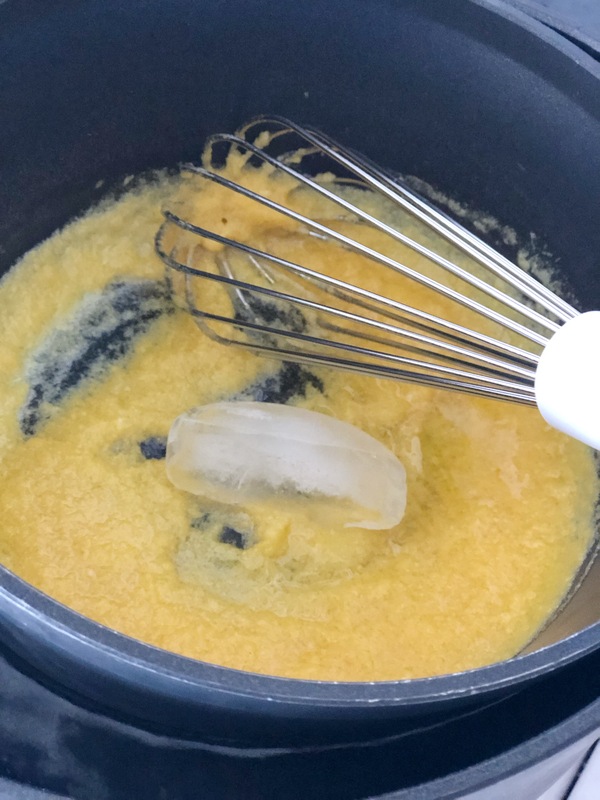 Slowly pour the room temperature liquid ghee or coconut oil very, very slowly! Gently cook the sauce on low heat for 5 min. Whisking constantly. Remove the top pan from the boiling water. in a separate pan add apple cider vinegar, white wine vinegar, minced shallots, pepper, tarragon on low heat until liquid is reduced by half. Whisk the sauces together to combine. Use 6 tablespoons per steak! 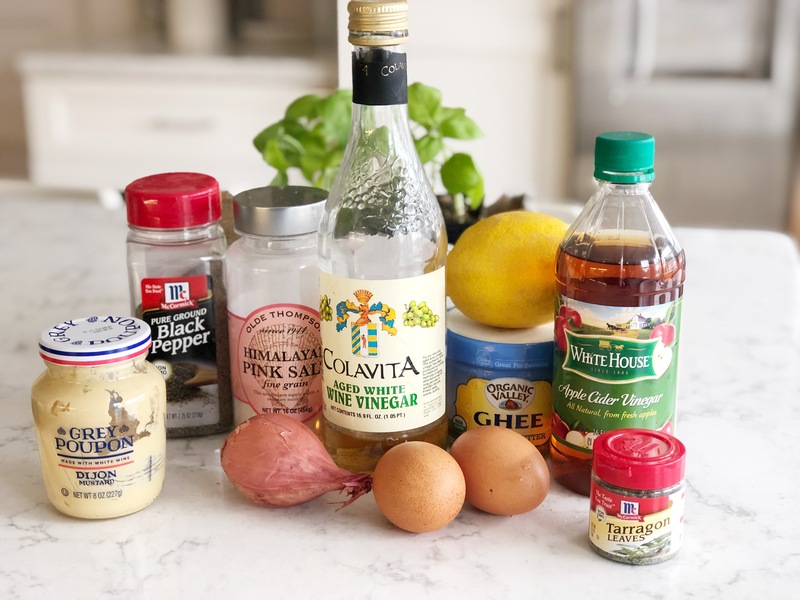 Let me know if you are doing KETO & if you try this recipe, I would love to hear how it came out! As always, follow me on Pinterest & as you know I love hanging out on Instagram too! OH & of course below is a Pin for you to save this recipe for later! « Thank you & Happy New Year 2019! Hi! I'm Kellie I am so glad you are here! 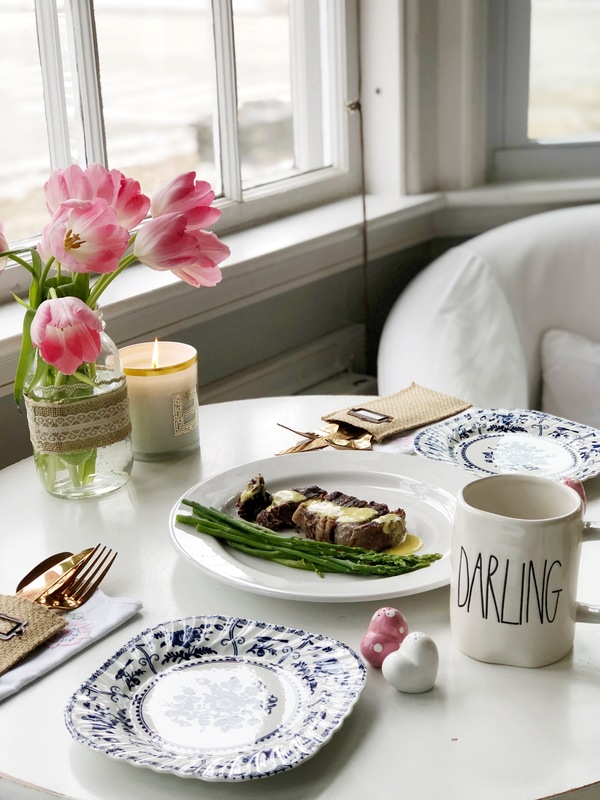 Some of my favorite things are vintage, cottage & farmhouse decor, I'm a big believer that you can create a beautiful home on a budget! My other favorite things are my 3 teenagers and my amazing husband who I still have a crush on! He is my DIY partner... I love meeting new friends so grab your coffee and bop around my blog! I am honored to have you visit! Wood Watch Giveaway from JORD! Thank you & Happy New Year 2019! Instagram Marketing-Does it Make Sense for Your Brand? Kitchen Renovation Progress with Lumber Liquidators! Hello! I am so honored you visited me today I hope you stay a while. I love meeting new friends here. My "love language" is quality time, so, oh how I wish I could actually visit with all of you! But for now we are in blog land together! Comment anywhere on my blog, I'd love to hear from you.